I was doing that rapid buzz through e-mail thing so many of us do to cross a “to do” item off our lists when this gem of a quote brought me back to mindfulness. It’s timely, of course (as so much is when we pay attention). 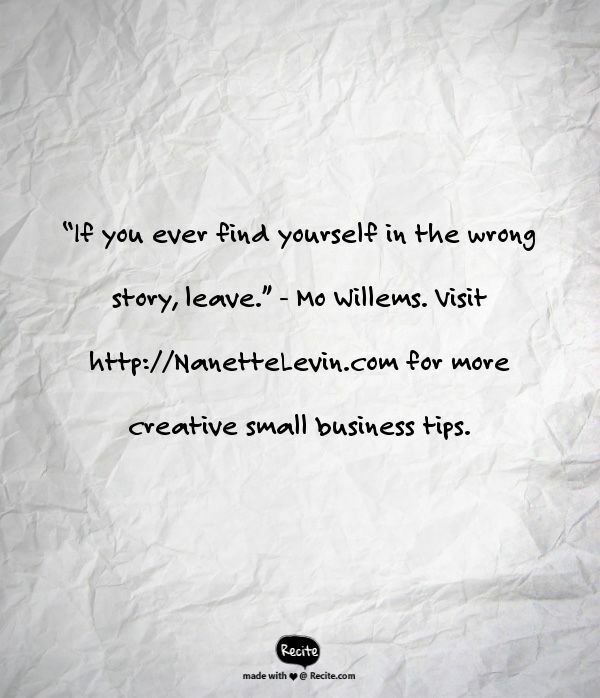 I’m in the process of “rewriting” my story on so many levels – but “leave” works too. As referenced in a recent post, I’ve moved to Virginia (goodbye “wrong story” Connecticut). In addition, I’m realigning the business to put greater emphasis on writing services. There will always be a marketing component to what I offer, but I’ve decided to focus the promotional strategy on wordsmith talents. 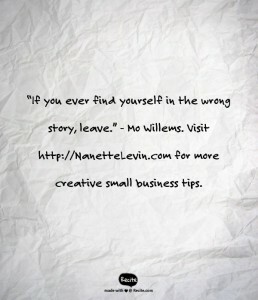 “If you ever find yourself in the wrong story, leave.” Is it really that simple? It is! I’ve done it many times and imagine you have too. Life’s short, so why not to relish majority waking moments (OK – sleep’s good too)? Think about what stories you’re living that you should leave (or rewrite by delegating tasks you’d rather not be doing). It’s no secret I’m a big believer in building teams for the fun that comes from reassigning tasks to better providers than you (who enjoy what you don’t). What are you doing to find yourself in the wrong story? Are you struggling to prepare speeches that don’t feel right nor sound suitable? Have you procrastinated finishing an article opportunity because you’re short on skills? Is there an important letter (introduction, disagreement, pitch, recommendation, resignation, personal note to a loved one artfully expressing what you want them to hear, cover letter, etc.) you’ve been putting off because you can’t find the right words? Have you been asked to provide copy content for an important award nomination (for you or another) and don’t know where to start? Do you spend too much time writing while missing more important opportunities that call on your special skills? Does your business suffer because you don’t have time to craft missives to prospects, vendors, clients and centers-of-influence? Is it difficult for you to gain objective perspective for messages designed to resonate with your intended audience (and if they’re customers, lead them to buying decisions)? Is your brochure, home page, landing page or general communications outreach strategy failing to convert? Would you rather be working on the tasks you relish with confidence in a talented and trusted copy writer to handle what frustrates or bores you? Hmmm – maybe we should talk. Personally, I’ve always had a hard time understanding how anyone would choose to live life where majority time is spent doing loathed activities. Perhaps I’m lucky with an entrepreneurial spirit instilled at a young age. Still, this idea of grinding through 40+ hours a week unfilled for the so-called security of a paycheck (these days, employee seems to be a far less secure position than business owner) makes no sense to me. I also don’t get the bandwagon of “personal development professionals” who claim it’s simply a matter of changing your attitude. No. People are wired differently. You don’t just decide it’s a new day and “voila”. BUT, finding a way to spend your income earning hours doing tasks you relish and excel at (these are always related) isn’t so hard. If you don’t like your job, eventually, you’re going to be bad at it. If it feeds your soul, everyone will see this and want what you have. Finding people you can lean on for those tasks that don’t grab you can improve your quality of life substantially. This is particularly relevant with entrepreneurial ventures. The way you spend your time (or dollars for the right team to make you look good) should put your personal focus on what you enjoy and where you excel. You’ll be amazed how quickly your mood, profits and opportunities improve when you offload those things you either weren’t doing or did badly to someone who can help make you shine. Think about it. Who’s in a better position than you to write your life story in a way that makes you proud? Sometimes it’s as simple as realizing it’s the wrong story then leaving it. Whether that’s a different job or just redefining the one you have, delegating to edit your life is easier than you think. Plus, you’ll be amazed at how motivated you get to realize a return on even a small money investment made toward your dream. Call me at (540) 400-7106 or e-mail NLevin@FulcrumNY.com if you think offloading those writing items could get you on a faster path toward realizing your dreams and getting out of the wrong story. I love this. I’ve left many a story. Because my Soul’s voice is so loud that if it’s wrong I feel it in my body, or feel much more anxious than normal… Maybe I’m extra sensitive, or maybe I’m deeply in tune with myself. In either case, I’m grateful! What a great way to say this, Ariella! So many fail to hear their soul’s voice. I’m glad yours speaks loudly. You should be grateful for the self-awareness you have. This is a gift. I hear you too on leaving others’ stories – this is particularly challenging with family. But as you say, worth the rewards. Good for you, Debbie – and what a fun image you suggest. “Trying it on” is a great way to express this. Of course, you won’t know if it fits (even tight works sometimes) unless you’re willing to give it a shot, will you? I hope testing your new look brings smiles to you and those you serve. Congrats on your move- and your move- to that new reframe! Thanks, Roy. It’s been fun (even with the unexpected challenges). Stay tuned or “Roanoke Revealed”. Great ideas, Nanette! It’s true that it’s easy to change in an instant, but I guess we don’t think it’s possible? I don’t know… why would we keep doing something we don’t like? Sometimes we create structures around us that make it hard to break out. Starting something new can be tough, but I think it’s so freeing. The possibilities are limitless! Good points, Naomi. Agreed, starting something new can be liberating. I’m not so sure it’s easy to change in an instant, but deciding to leave a story that’s not working for us is a whole lot less difficult than staying there. Sounds like you are definitely re-writing your story! Good for you. I am so excited to see how your blog shows up! Thanks for the encouragement – and assistance – Amy. Yes, lots of fun things to come. Totally agree with you Nanette, life is too short to be in a job that drains your energy and makes you miserable. I also have the entrepreneurial spirit and am grateful that I do. I need to take a look at the stories I’ve been writing in my personal life and re-write some of them. Thanks for this thought provoking post Nanette! Glad to hear you are enjoying your entrepreneurial spirit, Nancy. Yes, those personal life stories can be often more challenging than the business ones, can’t they? Sometimes, wrong stories don’t want to let us leave. Someone else’s story requires us to be there in a role that is great for them but not so good for us. Say, “victim” or “worshipper.” It can be hard to find a good exit when the other people in the story are actively working to make you stay. For example, a fellow I knew who had been drafted into the role of primary caretaker for his semi-invalid mother. Every time he tried to move outside that role, her health would suddenly worsen, forcing him to stay. Yes, of course, that’s true, Scott. Each of us, however, can take the reins of at least some portion of our life. Making every thinking moment about someone else’s story ultimately hurts everyone involved, in my opinion. What an interesting way to put this. I am curious as to how we can secure our story is written in our voice if we delegate that part. One example would be blogging. How would the person’s true voice be shared? This is so intriguing to me. Great post! Good question, Elda. Personally, I’m not a big fan of ghost written blogs, but it can make a lot of sense when the focus is on business branding. Sometimes the person the company is presenting as their “face” doesn’t have the talent or time to create engaging copy. Relative to delegating writing your story – it happens more frequently than you might imagine. Seems strange in the case of an autobiography or memoir, for example (if you see “with” as part of the “author” attribute, the name following is usually the one who wrote the book), but chances are the book would be painful reading if penned without help. What a great quote. So simple yet so true. Yep. Would like to call it mine, but credit must go to Mo. So glad to hear you’re living a life that now has you happily rewriting your story, Vickie. Challenges can be a lot of fun when we decide how the story unfolds, don’t you think?